Delegates described the situation as "confusing" and "desperate". 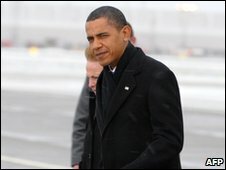 US President Barack Obama told the conference he had come to the summit "not to talk but to act". Addressing delegates on Friday, he said: "While the science of climate change is not in doubt, I think our ability to take collective action is in doubt right now, and it hangs in the balance." BBC environment correspondent Richard Black said some developing countries have repeatedly complained during the two weeks here of high-handed treatment by the Danish hosts and the West in general. "It is very confusing, and developing countries are very disappointed because they've invested a lot of time in the documents they're negotiating here - the Kyoto Protocol discussions have been going on for four years," said Martin Khor, executive director of the South Centre, a Geneva-based think-tank. "Now this other thing comes to undermine it, and people feel their time has been wasted," he told BBC News. Achim Steiner, director of the UN Environment Programme (UNEP), told BBC News: "Only the heads of state can bring this summit to a successful conclusion." He added: "But the summit as of this morning is a summit in crisis." There were reportedly a number of sticking points over the draft agreement. One of them appears to have been the absence of a commitment to a legally binding treaty, which many developing countries have been insisting on. "This declaration has all the meaning and authority of a bus ticket, and certainly won't save the planet," said Joss Garman of campaign group Greenpeace. "The leaders have just hours left to end this farce but they still can. If they don't step up now this conference will forever be branded the shame of Copenhagen." President Obama is due to meet individual leaders including the Chinese premier, Wen Jiabao. Correspondents say it is the US and China - the world's two largest carbon emitters - that hold the key to striking an agreement. Both countries have indicated they might make concessions. China signalled it might allow some monitoring of emission curbs while the US said it would commit money for developing countries. Addressing the meeting on Friday, UN Secretary-General Ban-ki Moon urged delegations to "seal a deal", adding: "It will be your legacy." Despite many expressions of concern about projections of climate change, finance has emerged as an issue more likely to make or break a deal than emission pledges, the BBC's Richard Black reports from Copenhagen. US Secretary of State Hillary Clinton said the US was prepared to help establish funding of $100bn a year for developing countries if a deal emerged that met US requirements. While Beijing has been hostile to this notion, Chinese Vice Foreign Minister He Yafei said China was ready to engage in "dialogue and co-operation that is not intrusive, that does not infringe on China's sovereignty". There was no immediate reaction from the US delegation to the Chinese offer but, an Associated Press correspondent reported that it went a long way toward meeting American demands. The draft declaration is reportedly set to mention a cap of 2C but a document prepared by the UN climate convention secretariat, which was leaked earlier, confirms that current pledges on cutting greenhouse gas emissions are almost certainly not enough to keep the rise in the global average temperature within that level. The analysis says that to achieve that goal, global emissions should be kept at or below 44 gigatonnes (Gt) of carbon dioxide equivalent (CO2e) in 2020. But if enacted, the current maximum pledges from developed countries would leave emissions 1.9Gt above that figure; minimum pledges would mean missing the target by 4.2Gt. Unless this gap is closed, it says - for example by developed nations raising their current overall offer to a cut of 30% from 1990 levels by 2020 - global emissions will "remain on an unsustainable pathway that could lead to concentrations equal or above 550ppm, with the related temperature rise around 3C". "The stark message for world leaders at Copenhagen is that the proposals on the table - especially from industrialised countries - fall far short of what the world needs," said Keith Allott, head of climate change for WWF in Britain. In another development, President Obama may reach an agreement in principle on nuclear arms reduction with his Russian counterpart, Dmitry Medvedev, when they meet in Copenhagen on Friday, a senior US official said.